Our final installment for now of the “Teacher Catch-Up” series is the one and only Maddie Flanigan of Madalynne.com. Maddie and I together for about 6 months planning this very big and detailed event. We talked about how Maddie wanted the event to feel and the day to flow and Maddie set to work making her immaculate curriculum while I did what I love to do.. plan a menu and event worthy of the instructor. Maddie is a very talented blogger, seamstress, and photographer, as well as MANY other things. But the focus of this event for her had to be on her talents as a teacher. It’s one thing to know something and quite another to teach it. Over the years, as The New Old Fashioned has grown Maddie has been a really big supporter of mine and has taken many beautiful pictures at our events. So, when it came time for Maddie’s event, I felt a strong need to go above and beyond to make the day perfect for both her and her students. 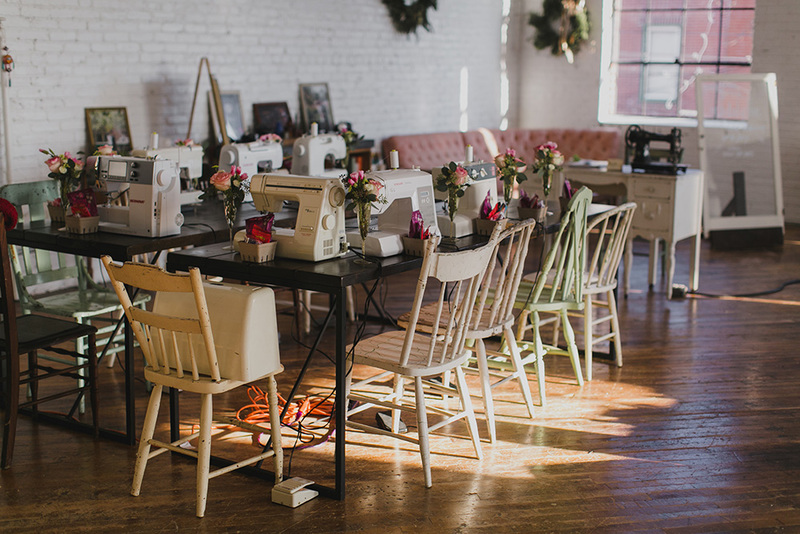 For this event we were extremely lucky to work with Love Me Do Photography , in their gorgeous studio no less!! We also worked with Meredith Langer for signage, Bekuh Browning for florals, mini beauty treatments by Parlour Hair and Skin, handmade award medallions by Buttonetta and of course those beautiful desserts by Nina The Midnight Baker and Doux + Sel Thanks again to all of you, for making this event the wonderful hit it was! Here is some very exciting news! If you missed Maddie’s premier Bra Making workshop, you can stop kicking yourself. Just head on over to Madalynne.com and choose from one of the Three dates she has coming up! How exciting is that? You can also look forward to a little New Old Fashioned catering as well! Purchase your tickets soon, because it sounds like all three are close to selling out already! Students will be attending from Singapore, Australia in addition to Atlanta and California? Maddie has a lot of surprises and guests coming in from around the globe. Hope to see you there! Buy Tickets Here. NOF: What was your favorite thing about the workshop you collaborated on with The New Old Fashioned? Maddie: I had a clear vision of how I wanted my workshop to be - the environment, the setup, the food and all the other accoutrements. Anna not only executed seamlessly, but also got my students excited before and after the class so that it would be a memorable experience they will never forget. NOF: Why do you love instructing and sharing your passion, as opposed to just working on your craft and creating only the finished product to market? Why share your knowledge? Maddie: Mother Teresa said, “It's not how much we give but how much love we put into giving.” Because I was a college dropout, it took other people believing in me and giving me a chance to get me to where I am today. When those people gave me the opportunity, I promised that in return, I would give other's the opportunity as well. But not just give back, I would give back whole-heartedly with all the same amount of love I have for sewing. NOF: What are some of the things you would like to learn how to do? (crafts, hobbies, anything at all)? Maddie: Rather than learn a new craft, I want to push my craft, bra making, further. NOF: What are you working on right now that you are most excited about? (writing a book, selling new products, or working on a big project or event)? Maddie: In addition to continuing to make lingerie, I'm really excited to publish my book, Portrait of a Seamstress, later this year (hopefully). Thank you Maddie for taking the time out of your very busy schedule to catch up with us!